Expedition 58 flight engineer Anne McClain of NASA looks on as a Celestial Buddies' Planetary Pal Earth plush toy floats in zero-g on board SpaceX's first Crew Dragon spacecraft to dock to the International Space Station on Sunday, March 3, 2019. The launch of SpaceX's first Crew Dragon space capsule to the International Space Station did more than just advance the day when astronauts will again fly into space from U.S. soil. It also resulted in a rush for plush blue and green toy orbs. Jon Silbert was unaware of that connection, though, when on Friday (March 1) orders suddenly started pouring in for Planetary Pal Earth. The vice president of sales for Celestial Buddies (and the father of the product line's creator, Jessie Silbert), he had yet to see the tweet from SpaceX CEO Elon Musk revealing that Celestial Buddies' anthropomorphized planet Earth toy was flying on board the Crew Dragon for the spacecraft's uncrewed test flight to the orbiting laboratory. "Super high tech zero-g indicator added just before launch!" wrote Musk on Twitter, sharing a photo of the plush Earth doll just four hours before a SpaceX Falcon 9 rocket lifted off on the Crew Dragon Demo-1 mission from NASA's Kennedy Space Center in Florida at 2:49 a.m. EST (0749 GMT) on Saturday. Borrowing a tradition from Russia's space program, SpaceX flew the Celestial Buddies' Earth on the Crew Dragon so that when the vehicle entered orbit, live video from inside the capsule would show the personified planet toy floating in microgravity. "I think for members of the public, the real fun thing will be seeing the little Celestial Buddy, little tiny Earth, humanoid Earth thing, floating around in zero-g. I think the public will be most excited about that," said Musk at a post-launch press conference on Saturday morning. And he was right. The public was excited; enough so for hundreds to want a 'little Earth' of their own. 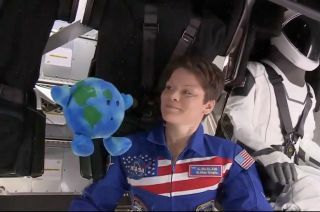 Celestial Buddies' Planetary Pal Earth plush toy floats in zero-g on board SpaceX's first Crew Dragon spacecraft to dock to the International Space Station on Sunday, March 3, 2019. Silbert had yet to hear Musk's comments when he started putting "two and two together," noticing that a number of the orders were coming in from Florida and California, two places that were associated with the SpaceX launch (the company's mission control is located at its headquarters in Hawthorne, California). Confirmation soon came by way of a Celestial Buddies' patron who reached out to Silbert to pass along the news. "By that time I was exhausted and I went to sleep," Silbert told collectSPACE in an interview on Saturday afternoon. "When I woke up, I discovered a couple hundred more emails." The number of orders — "at least a couple hundred," said Silbert — exceeded the available stock of Earth that Celestial Buddies had on hand. "We thought that we had enough to get us through to our next shipment from the factory, but we didn't expect anything like this," Silbert said. "So we're actually on back order right now." And that is a first for the eight-year-old company. Started as a hobby by a high end fashion designer who sought to bring the wonder of the planets, moons and other celestial bodies "down to Earth," Celestial Buddies' largest sale driver up until now had been the museum and science center gift shops it supplies. Celestial Buddies' Planetary Pal Earth plush toy. In an effort not to disappoint Celestial Buddies' new SpaceX-inspired fans, Silbert began emailing those with back orders with the option of waiting, receiving a full refund or having their Planetary Pal Earth order upgraded (at no additional cost) to the company's new "Our Precious Planet," a larger, more detailed version of Earth that also serves as a "gentle introduction" to global warming and climate change. The original Planetary Pal Earth dolls will not be back in stock until late April. In the meantime, SpaceX's Crew Dragon arrived at the space station on Sunday, resulting in more views of the Celestial Buddies Earth floating in the spacecraft. Soon after opening the hatch leading into the capsule, NASA astronaut and Expedition 58 flight engineer Anne McClain positioned herself between the toy and a spacesuited anthropomorphic test device (named for a sci-fi heroine) during a televised welcome ceremony for the commercial capsule. "On behalf of 'Ripley,' little Earth, myself and our crew, welcome to the Crew Dragon," McClain said from on board the spacecraft. "Welcome to the new era in spaceflight." Silbert said that he is grateful to SpaceX for the exposure ("Musk gave us a great boost") and he is proud to see his daughter's creation in space. "This is its 15 minutes of fame, I guess," he said. "I am now not only a father, but now I have a 'grandson' in space." Watch a video of Celestial Buddies' Planetary Pal Earth floating aboard SpaceX's Crew Dragon docked to the International Space Station at collectSPACE. Follow collectSPACE.com on Facebook and on Twitter at @collectSPACE. Copyright 2019 collectSPACE.com. All rights reserved.